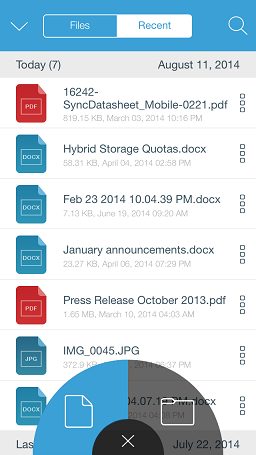 The Syncplicity app provides the capability to quickly view those files and folders that were recently accessed. A recently accessed folder is a folder where one of its files was recently opened. To see recently accessed folders and files, go to the files screen which you can access from the main menu by tapping Files. At the top of the screen, tap Recent. All the folders that were recently accessed are shown. Tap the icon at the bottom. You can list recently accessed files or folders. In the example above, the left image shows the file icon selected and a list of recently accessed files, the right image shows the folder icon selected and a list of recently accessed folders. 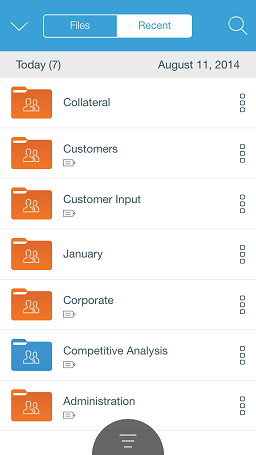 Once you select a file or folder, that selection is remembered for the next time you access recent files and folders. You can tap the X at the bottom to minimize the file and folder selection. 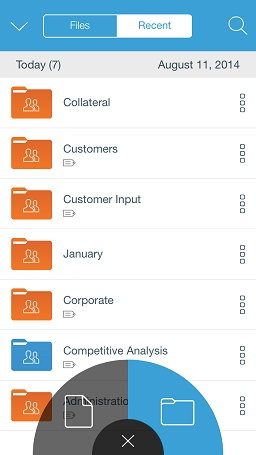 Once minimized, you can drag the folder/file selection icon to the sides or top of the screen. Tap Files at the top to leave this screen.